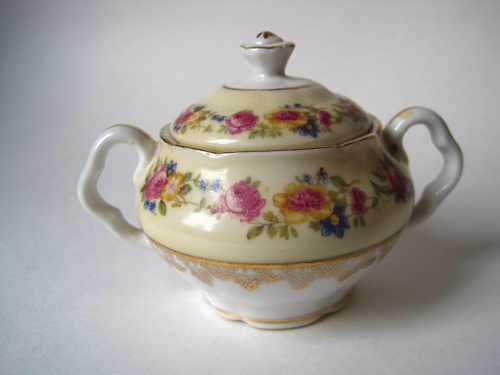 Teatime Tale #5 — Outbid! Laura told herself not to get her hopes up. She had wanted one of those lovely old-fashioned tablecloths for years. She had never learned to crochet as both of her sisters had, so instead she prowled flea markets, yard sales, and eBay looking for pretty old linens since she didn’t know how to make them herself. A few years ago, she was searching eBay when she’d come across the prettiest tablecloth ever. 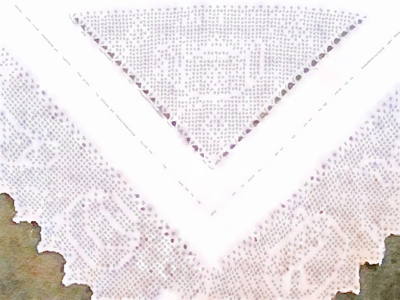 Pristine white and made of fine linen, the cloth was an elegant square trimmed in a filet crochet edging that depicted a teapot, teacups, and sugar and creamer. 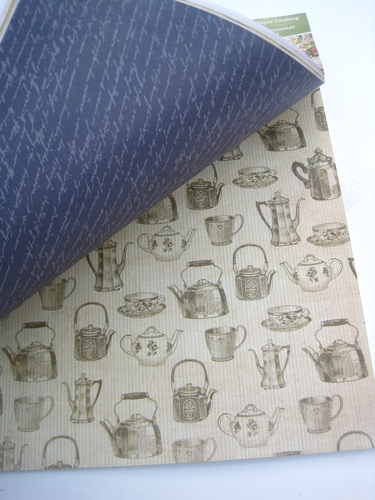 In mint condition, it was the prettiest teatime tablecloth Laura had ever seen. Unfortunately, the eBay buyers thought so too and got into a bidding war over it. The price ultimately shot up to more than a hundred dollars, so Laura didn’t win it. Ever since, she’d watched eBay looking for a similar tablecloth. A week ago, Laura got an alert from eBay in her morning e-mail noting that another of those beautiful tablecloths had just been listed. She was thrilled. This time, she was not going to let the tablecloth get away. Still, she knew she needed to exercise caution. Laura had often wondered why she was so attracted to old linens. Maybe it was because they were vintage. Maybe it was because of the delicate needlework. Maybe it was because she liked to imagine the woman who once made the piece. And maybe it was a bit of all of that. Laura had been watching the tablecloth auction on eBay for a solid week, and no one had even placed an opening bid of $19.99. In her mind, it was already “her” tablecloth, and she had a hunch the bidding would turn out differently this time. The auction went off at 3:16 p.m. on Friday, and by 2:16 that afternoon she was in the living room staring at the laptop screen in front of her. Watching. Waiting. She couldn’t wait to win “her” tablecloth. At a quarter till three there were still no bids. Then, at 3:01, they started to appear. First came the $19.99 bid. Then the price of the tablecloth quickly shot up to $25.99, then $27.99, and $29.99. Soon, the bid was $44.99, and then $57.99. Laura did not like the turn the bidding had taken. The bidding was already at $86.99, and there were 13 minutes left in the auction. When the bid got up to $101.99 with 10 minutes left, Laura closed her laptop, sighed, and went into the kitchen where she made herself a cup of plum-flavored tea. Clearly, she wasn’t meant to have this tablecloth. It had been two years since she last saw one of these gorgeous cloths listed on eBay. At this rate, it could be another two years before one even came up for auction again. Maybe she just needed to learn how to crochet and make her own tablecloth with the fancy crocheted edging. But no, that would never work. She didn't like to stay indoors very long, and once gardening season arrived, she would be outside separating the irises and pruning the rose bushes. It was time to forget the tablecloth and move on. The next morning, Laura decided to stop by her Aunt Carolyn’s house before going grocery shopping. “Hey, hon,” Carolyn said. “Come on in and have a cup of tea.” Her aunt could always be counted on to offer a cup of tea. Laura headed into her aunt’s kitchen to turn on the stovetop tea kettle, and her aunt walked up behind her and handed her a wadded-up Walmart bag. “Just something I found at a yard sale yesterday. Looked like the kind of old linens you like,” she said, heading back to the living room. While Laura waited for the water to boil, she looked in the bag and couldn’t believe what she saw. Laura unfolded the pristine white square of fine linen and studied the immaculately crocheted edging of a teapot, teacups, and sugar and creamer. 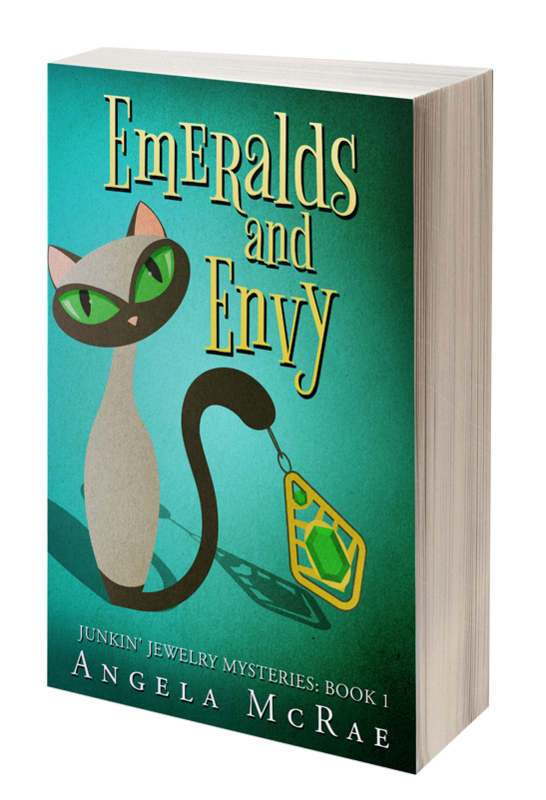 Goodness, I almost let January slip by without offering a giveaway! 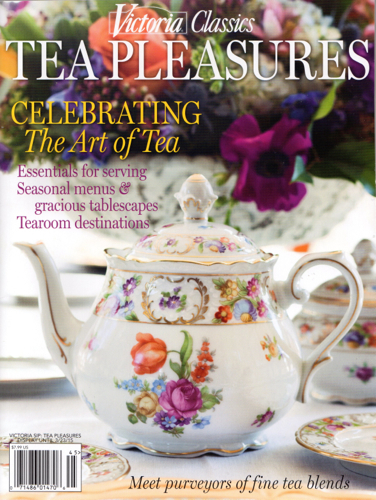 Now I should have done this one earlier because I know many of you already have a copy, but if you don't, I'd love to give one of you a copy of this new special issue from Victoria Classics, Tea Pleasures. If you'd like to be entered to win, just leave an "Enter me" comment to this post between now and 7 a.m. Monday, February 2. (U.S. and Canada only, please.) Good luck! Puerh, I’ll admit, is a tea that’s not to everyone’s liking, but I enjoy it. It’s got an unmistakably earthy taste that is quite different from the girly, frou-frou flavored teas I normally enjoy. 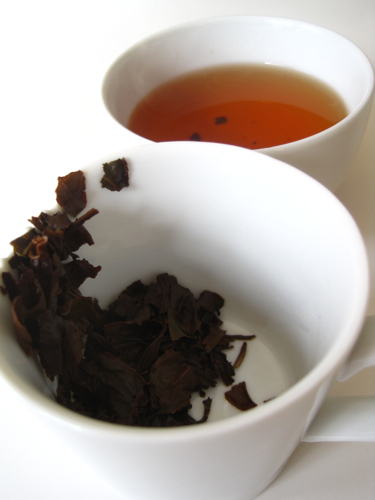 This tea is produced in Yunnan, China, and after production the leaves go through a fermentation process and are often made into “cakes” of tea. 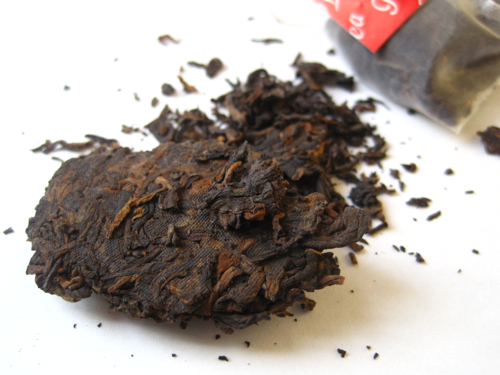 As you can see here, this sample of puerh tea was originally part of a cake. 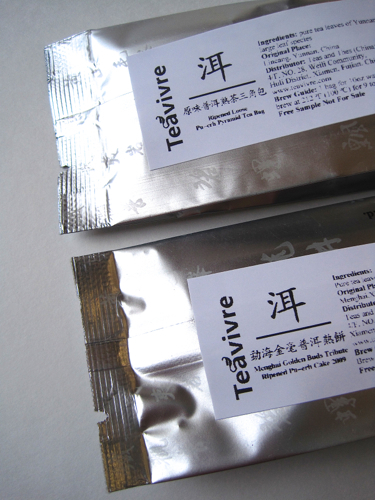 I recently received a package of puerh samples from Teavivre, and I was intrigued to note on the packet that some of the samples arrived “raw,” in cake form, and some are in pyramid tea bags. 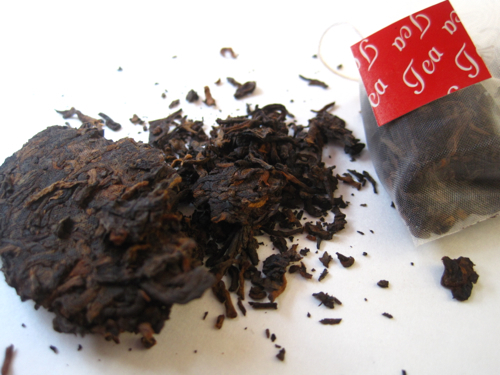 The first sample I tried was the cake form on the left, Menghai Golden Buds Tribute Ripened Puerh Cake 2009. The package said to brew it at 212 degrees for 3-10 minutes, and I opted for the 3 minutes. I loved the extra earthy taste of this puerh. I like the flavor of puerh anyway, but this one had a richness to it that I especially enjoyed. Later, I tried the pyramid tea bag containing Ripened Loose Puerh, and I noted it said to steep it at 212 degrees for 9 to 12 minutes. Okay, I thought. We'll see … But you know, after 9 minutes I had a tea that looked as dark as coffee and another great, earthy tasting puerh, not oversteeped and not bitter at all. I still consider myself quite a puerh novice and haven't yet developed my palate enough to call these teas anything but "earthy," but I do recommend trying any tea at least once. These teas are very different from my usual flavored teas, but it's nice to shake things up once in a while, and I'm grateful Teavivre allows me to do just that! Got an extra $26 million lying around? I was looking up some interior design articles online when I happened upon a real estate listing in Washington state that caught my eye. 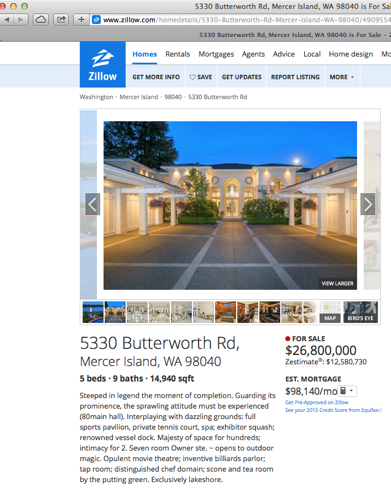 It was for this $26.8 million home on Mercer Island, Washington. It's huge and gorgeous, naturally, but what most intrigued me was the next to the last line in the description: "Scone and tea room by the putting green." Now that's a luxury I could live with! If you click here you can see the gallery of photos, but unfortunately the individual photos are not labeled. Now I am quite eager to know which one is the scone and tea room. It's the one "by the putting green," but I see lots of photos that I suppose could be by a putting green. (Any golfers reading today?) I'm guessing it's one of those pretty white rooms, but I don't see teawares or tea-themed art in any of the rooms to help me out here. Your thoughts? Please let me know if you figure it out. Or if you decide to buy the house! My garden club has its first meeting of the year tonight, and none too soon, because I'm ready to kick off the gardening year! 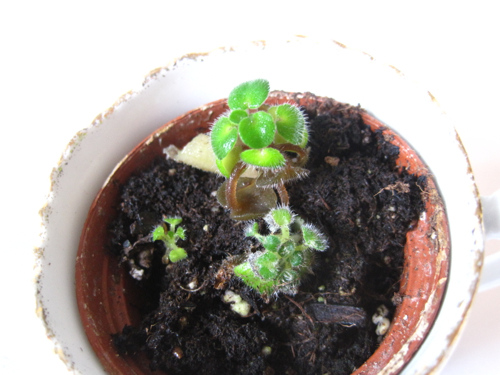 Some years ago, I had great success growing and rooting African violets. When I got married and moved to a new home eight years ago, the light from my kitchen windowsill didn’t seem to make the violet leaves happy anymore, so I had no luck with rooting them, merely rotting them instead. But I’m not one to give up easily, so I kept sticking African violet leaves into a small vase of water on the windowsill. 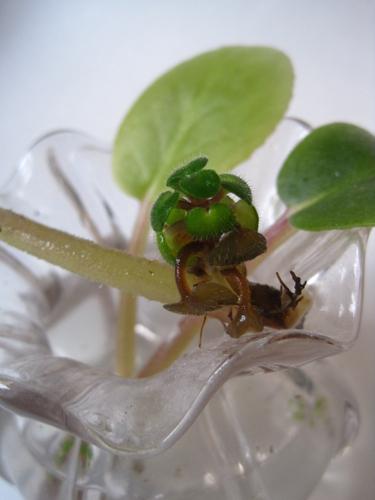 I still have not been able to obtain that stem with roots that I used to acquire so easily once upon a time, but what I have found, to my surprise, is teeny tiny little plants that are growing underwater and attached to the stem! Now how does a plant like this grow underwater? I don’t understand how it does this at all, but online research tells me that it is possible, so I'm hopeful that maybe these miniature plants will grow big and strong. 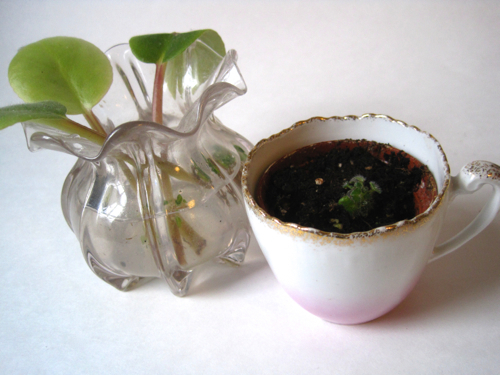 As you can see here, I’ve removed three of the underwater leaf groupings and plopped them in some potting soil in a pink demitasse cup. Only time will tell if they make it, but I’m keeping my fingers crossed. 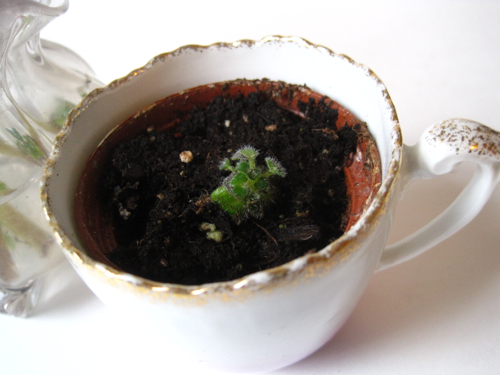 Do any of you grow plants in teacups? If so, what do you grow? I’m eager for garden season to get here this year, and my windowsill garden is providing a bit of amusement until that happy day arrives. I think I see a pattern here. On Sunday afternoons, I like to make a sweet treat to enjoy while watching "Downton Abbey" later in the evening. This week, I saw I had an extra bag of cranberries left over from holiday baking, so I looked online for a simple cranberry muffin recipe. I found one from Ocean Spray here, and I liked the fact it included blueberries as well. But naturally I ended up tweaking the recipe a bit. I used fresh cranberries instead of dried, I flavored the milk with a berry-flavored tea, and I added slivered almonds. The result was exactly what I was hoping for, and it couldn't have been any easier to whip up. I think even Mrs. Patmore would be pleased with the delicious results! Preheat oven to 400 degrees and spray a 12-cup muffin tin with baking spray. In a mixing bowl, combine flour, 1/2 cup of the sugar, baking powder and salt. 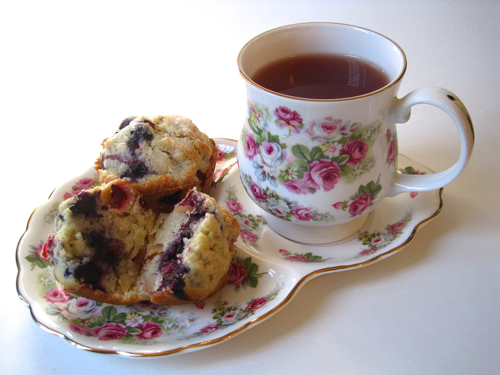 Heat milk for 2 minutes in microwave (or boil on stovetop), add berry flavor tea bags, and steep for 5 minutes. Discard tea bags, then combine egg, milk and oil in small bowl. Add liquid to dry ingredients and stir just until moistened. Add cranberries, blueberries and almonds. 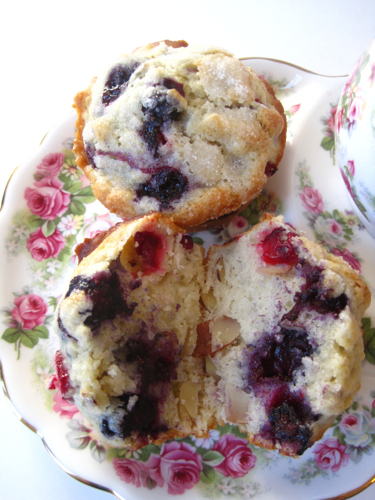 Fill muffin cups 2/3 full and sprinkle with remaining 2 teaspoons sugar. Bake for 20 to 25 minutes or until brown around the edges. Yields 12 muffins. Catholics, I am told, believe in the doctrine of Purgatory, an intermediate state after death where the heaven-bound undergo purification in order to achieve holiness before entering heaven. Southern Baptists have something similar, only we call it the Women’s Ministry Committee Meeting for the Annual Spring Tea. Starla Mooneyham has called the meeting this fine Saturday morning in January so we can decide on the menu for our 42nd Annual Spring Tea. The Spring Tea is second in importance only to the Second Coming at my church. Women pull out their best china and set a table in springtime pastels. We're supposed to do this because we love the Lord and want to reach The Unchurched, but the truth of the matter is that some women—looking at you, Eloise Wilson—like to show off their table-setting skills and family linens. Starla knows that I, Brenda Johnson, am the president of the local tea society, so I'm sure that's why she invited me to be on the committee again. Ten of us were asked to prepare a tray of our favorite tea sandwiches, and today we'll choose five of them to serve at the Spring Tea. Now I didn't have to think twice about what to make. Friends always rave about my Waldorf Chicken Salad on Mini Croissants, so I whipped up a bowl of chicken salad last night and made the sandwiches this morning. I don't like to brag, but I've basically perfected this recipe, so I’m sure it’ll be chosen. I almost feel sorry for the other ladies since not all of us can have our sandwiches selected, but what can I say? I've been making tea sandwiches a long time. I will not apologize for that. Starla calls the meeting to order and asks Ann Simpson to pray. I wish she had called on someone else. Ann believes in informational praying, the kind where the pray-er feels that she has to give God a news update on the pray-ee. "And Lord, we ask you to be with Carolyn, because she couldn’t be here today since her sinuses are acting up again. Dear Lord, we just thank You that You can solve her sinus problems and work on that unspoken marital need of hers all at once, dear Lord." After what seems like an eternity, Ann decides to wind things up, and we all gather round to sample tea sandwiches. I don’t eat one of my own sandwiches, of course, because that would be tacky. Instead, I double up on Mary Lou Carter's pimiento cheese sandwiches. 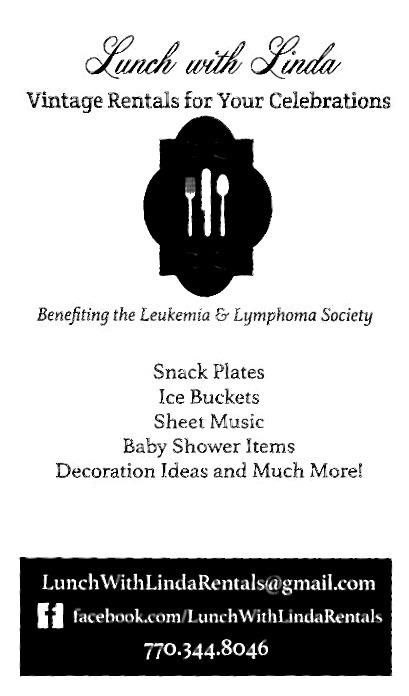 Mary Lou can hardly boil water, bless her heart, and you do not want that woman making a thing for the fall bake sale. I’ll tell you that right now. But Mary Lou makes the best pimiento cheese of all of us, a fact I find no less miraculous than Jesus turning the water into wine. Marcia Brown brought some cucumber sandwiches she cut out with a cute little flower-shaped cookie cutter. They taste fine, but a plain old cucumber and cream cheese sandwich isn't very imaginative, in my humble opinion. Starla offered to make the tea for our sandwich tasting, which I knew meant she’d bring some off-brand from the dollar store. I cannot seem to convince these women of the importance of using quality loose-leaf tea. Starla wouldn't know quality tea if it jumped out of the tea tin and slapped her upside the head, but she's the one leading the ladies this year, so I don't say anything. As usual, I just keep my opinions to myself. After about thirty minutes, we're all through eating sandwiches. Ann notes that the group has always voted on the sandwiches by secret ballot. Starla, however, wants us to discuss our favorites openly and agree on the selections. That suits me fine, but I don't know how some of the ladies will take it when theirs aren't chosen. I am not at all surprised when Starla points to the tray with my sandwiches—or what used to be my sandwiches, since only one is left. I'm accustomed to this. She picks it up and says, "These tasted great, but they’re a bit large for the luncheon plates. We'd probably need to cut them in half, and I'm sure Brenda would rather we not do that. So thanks for bringing these, but I think we need to go with some smaller sandwiches." To say that I am stunned is an understatement. 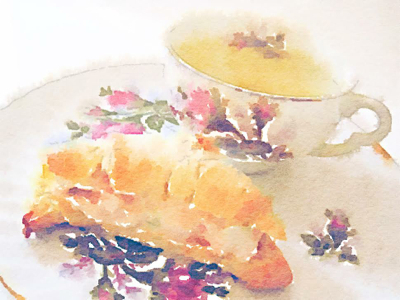 Does Starla not understand that women love my Waldorf Chicken Salad Mini Croissants? Is she unaware that my recipe once appeared in Southern Lady magazine? Where does she get off saying my mini croissants are too big, anyway? Who died and made her the tea sandwich queen? I quickly realize I’ve missed something. "Sorry. I was busy thinking about what I'm cooking for Sunday dinner tomorrow. Could you repeat that?" "We just wanted to see if you like Marcia's cucumber sandwiches as much as everyone else does. They seem to be the favorites." "Yes, they’re very good," I say, forcing a smile. Very good if you don't mind a boring, overused, underimagined tea sandwich that looks like a third grader assembled it. "Great," says Starla. She adds cucumber sandwiches to the list that also includes Mary Lou’s pimiento cheese sandwiches, Starla’s own egg salad triangles—which I personally find a little low-rent for teatime, but I don’t say anything—and two sliced fruit sandwiches, apple and strawberry, that just happen to have been made by Starla’s two best friends. Nobody ever serves two fruit sandwiches at a tea. But I don’t care. Like I say, I always keep my opinions to myself. If these women want to behave like a bunch of teatime amateurs, why should I care? I’ve been thinking of becoming a Methodist anyway. I wonder if they have a Spring Tea? This week I had a meeting with one of our clients, and as soon as I sat down at the table, she placed this sugar and creamer in front of me and asked if I still collect teawares. "Yes ma'am, I sure do," I said, and she told me she is cleaning out some things and wanted to give me this cheerful yellow creamer and sugar set that belonged to her late husband's grandmother. Can you believe that? Even though I call this woman a "client," which technically she is because I'm assisting her with a project, I consider her more of a friend since I've known her for nearly 30 years now. I was so touched that she wanted me to have these pieces. I like the shape of the handles on this lidded sugar bowl. 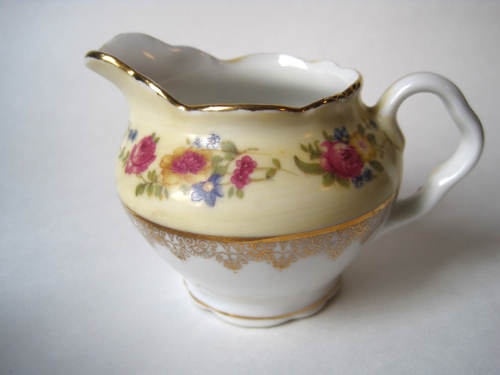 And the creamer is lovely as well, with its gold design around the middle reminding me of lace. 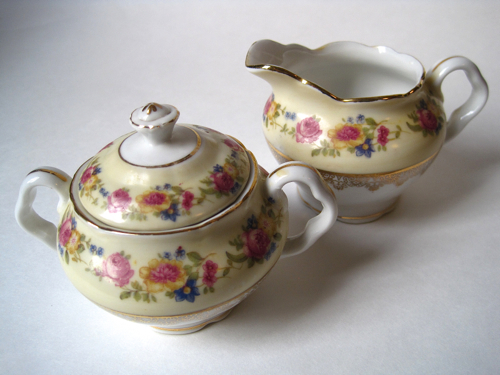 Each piece is about 2-1/2 inches tall, and I think they'll blend just beautifully with lots of my teawares, including the Royal Winton Welbeck Chintz I decorate with each spring. 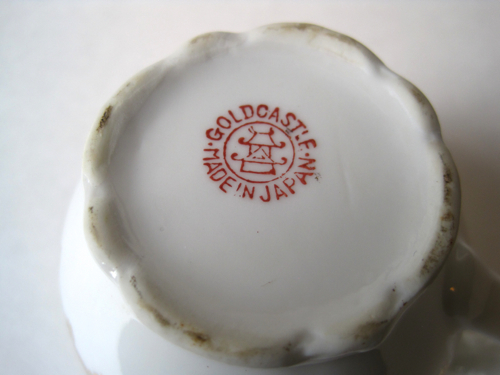 The backstamp says "Goldcastle, Made in Japan," and that's a new name in china to me. It's fun to have a new company to research, and it's even more fun to have a treasured gift from a friend thoughtful enough to share some teawares! One of the lovely things about having a blog is that I am able to search the blog for things I've written about in the past. 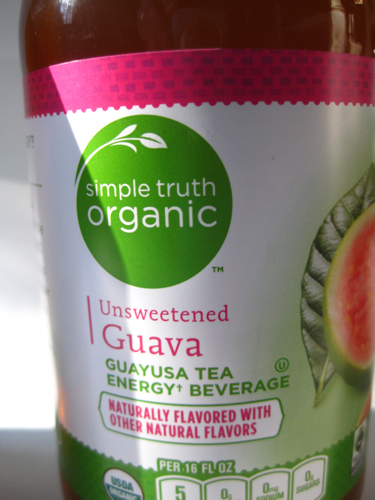 This week, when I saw some bottled Guayusa herbal teas at Kroger, I thought, "Oh, I just tried hot Guayusa teas a year or so ago, I believe." To my surprise, it was much longer ago than that. 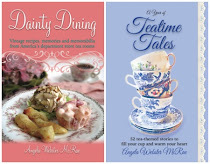 (Go here if you want to read about these teas.) 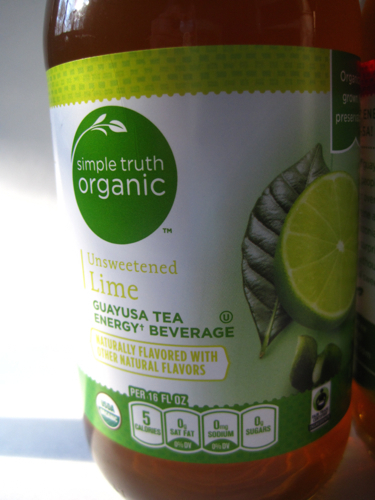 The new bottled Guayusa teas are from the Simple Truth line of organic products at Kroger, and I decided to try both the Lime and Guava flavors. The good news is, each 16-ounce bottle of tea has just 5 calories, and there's no fat, sodium, carbs or sugars. That's the good news. I did detect the fruity flavors in both the lime and guava varieties. The bad news, alas, is that these teas don't taste too great. They're not the worst bottled teas I've ever tried, but they're not ones I'd buy again either, largely owing to the almost medicinal aftertaste. I thought $1.59 was a great price for such a healthy bottled herbal tea drink, but I really want my teas to taste good, too. 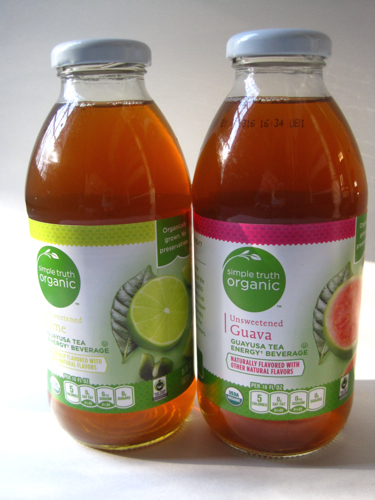 Have you tried Guayusa teas, hot or bottled? If so, what did you think? Every once in a while, my taste buds grow weary of the flavored black teas I usually sip and beg for something different. 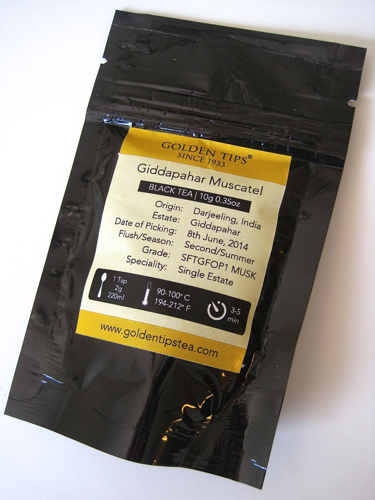 So this week, I looked through the teas on my tea rack and found a sample I hadn't yet tried, some Giddapahar Muscatel black tea from Darjeeling, India. This tea was a sample I received from Golden Tips, and I have thoroughly enjoyed their teas that I've tried. When I opened the packet, this one had that nice scent of wood shavings I have come to associate with the freshest teas. The leaves ranged from black to golden brown. When I steeped them, I detected a musk type of scent, the sort of thing I find in some women's cologne (and usually do not like). But I was intrigued, and when I sipped the tea, it had a rich, full flavor, almost perfume-like but yet subtle, and I very much enjoyed the copper-colored liquid with its notes of musk. 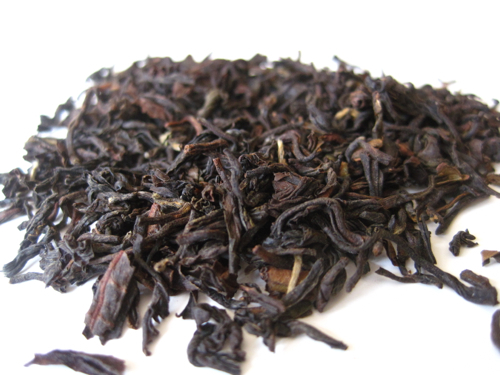 It was nice to sip a single estate tea for a change, and this one from Darjeeling gets two thumbs up! I'd honestly been meaning to go online to order some photos and catch up on scrapbooking, but I just hadn't taken the time. Then came that frightening little e-mail from Snapfish letting me know I had just a few days left to pony up an order or they'd delete those photos I'd uploaded. Yikes! So, I got busy late one night and ordered photos from Christmas, Thanksgiving, last year's big birthday trip to Europe, and more. Who knew you could order 300 photos and barely make a dent in the backlog? At any rate, once the photos were on the way I realized I needed to buy a new scrapbook, so I did. 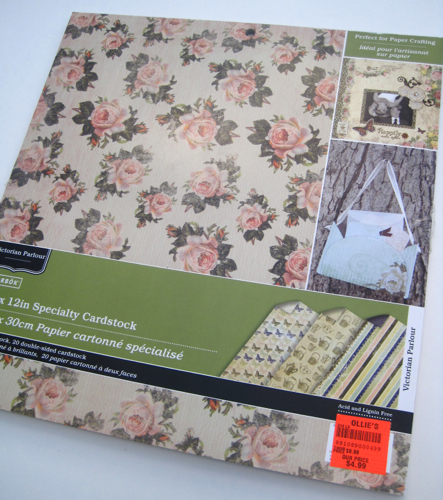 And that meant I needed new scrapbooking papers for the background, so I was naturally interested when I saw these pretty ones for $4.99 at Ollie's Bargain Outlet over the weekend. "Victorian Parlour" is the name of this pad of paper from Colorbok. There at the store I flipped through it to make sure it was frou-frou enough for me, and it was. 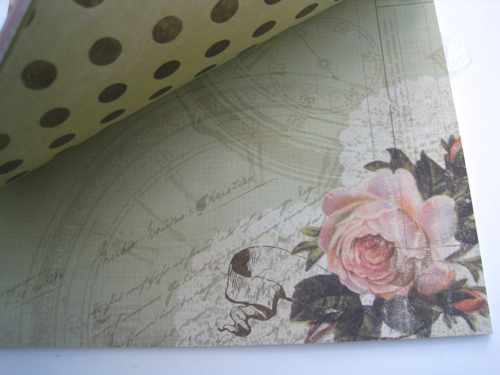 I love this rose design paper with the handwriting and doilies in the background. Perfect! "But wait, am I seeing what I think I'm seeing?" I thought. Yes. 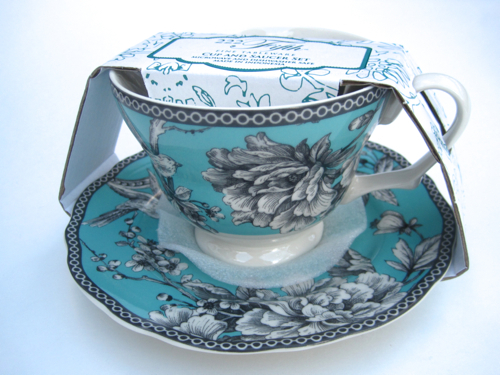 And when I saw this pretty teapot, teacup and teakettle paper, I knew this was definitely the papercrafting pad for me. Now, if I could just have about two weeks with nothing to do but catch up on scrapbooking, I think I'd be in good shape! Fun (and almost-free) tea finds from T.J.! So I had a $10 gift certificate to use at T.J. Maxx, and when my Aunt Jane and I went shopping over the weekend, I used it to buy a new teacup and tea towel. 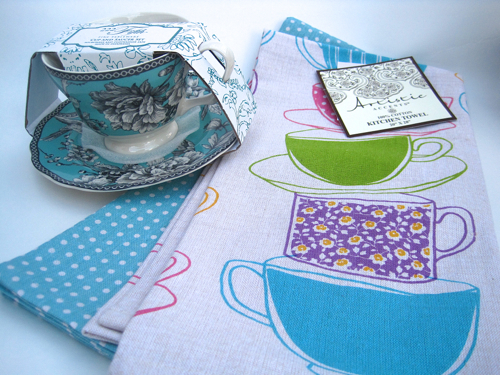 I went *slightly* over my certificate amount by choosing a $5.99 teacup and a $4.99 tea towel, but I was quite pleased with my almost-free purchases! One of my kinda-sorta decorating goals is to fill my tiered teacup stand with four turquoise teacups. I had only one before Saturday, but when I saw this one, I decided the color was perfect. The pattern is called Adelaide Turquoise, and it's from 222 Fifth, whatever that is, made in Indonesia. I also decided I enjoy drinking a very large cup of tea out of this oversized teacup. 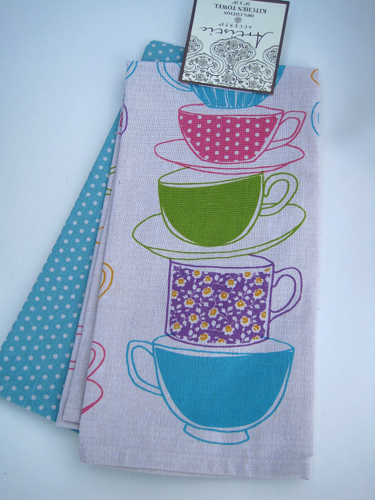 So, did you all find any new tea goodies over the weekend? Please share! It’s another snowy morning here in Cleveland, Ohio, as good a time as any to sort through that box of stuff that belonged to Grandma Prescott. I’m still unsure why Mom gave it to me. There are some old letters Grandpa wrote to Grandma during World War II. We’re lucky Grandpa came back since so many men didn’t. Think I’ll set those letters aside to read this afternoon. Here’s one of those cardinal figurines Grandma used to collect. She did love her pretty red birds. What’s in this old pillowcase? I don’t remember seeing this when Mom gave me the box. 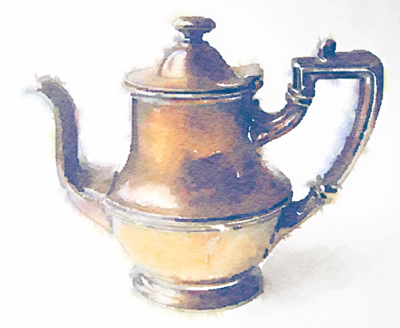 A tarnished silver teapot. Hmm. The lid doesn’t come off. Oh, it’s got a hinge. Guess you’ll never misplace the lid that way. What does it say on the bottom? “The Heery Brothers Tea Room.” Hey, that’s the old tea room where Grandma worked when she first met Grandpa. Or at least I think that’s what Mom always said. I’ll have to ask her about that next time we talk. I wonder why Grandma kept this old teapot? Alice Fay Davidson loved her job at the Heery Brothers Department Store Tea Room in Cleveland. She’d worked there a year now, hired the same week she graduated from high school in 1942. Heery Brothers was Cleveland’s most upscale department store. Women were eager to work there for many reasons, not least of which was the employee discount. Alice liked knowing she could always afford a new scarf or blouse each payday, proudly taking each new purchase home in one of the store’s famous shopping bags with salmon-colored geraniums on them. The other reason Alice enjoyed her job was that like most 19-year-old women, she was eager to get married and start a family, and a lot of handsome men shopped at Heery’s. She had dated the boys in high school, but that was the problem—they were just boys. Alice was looking for a man. One Wednesday afternoon, some time between taking Cobb Salads to two ladies at Table Three and delivering the check to a mother and toddler at Table One, Alice saw a man at Table Four who nearly made her drop her order pad. She was about to place it back in her apron pocket when she glanced up and saw the man in uniform boldly watching her. He didn’t even try to hide his interest. Alice quickly looked away, but she couldn’t forget that face. Those eyes. She headed to the kitchen to pick up another order, and when she got there, Blanche Monroe, the manager, whistled at her. “What’s that for?” Alice asked. Alice had to admit the man was good-looking. She composed herself before going over to take his order. Filling one of the small silver teapots in the kitchen, Alice was grilled by Blanche and her fellow waitresses. But Alice didn’t have time to waste. She took Frank’s tea to his table and poured him a cup before taking his lunch order of Almond Rarebit, a popular cheese and toast dish. No one joined him for lunch, and when she took him the check at the completion of his meal, he was extra friendly, telling her he was in town on business from Wright Field over in Dayton. “How long have you worked here?” Frank asked. “I’ve got an idea of where you can go,” Frank said, his blue eyes twinkling. Frank pulled out a small notepad and pen. He asked Alice for her phone number and address and said he’d see her at seven p.m. Friday. “It was nice meeting you,” she said as he rose to leave. Out of the corner of her eye, she saw two of the waitresses watching them. Blanche, who had suddenly decided she needed to refresh the flowers on Table One, overheard the whole conversation. “Give me that teapot,” she told Alice once Frank left. “Just hand me the teapot and put a lid on it, will you? My fancy new pierced-edge "china"